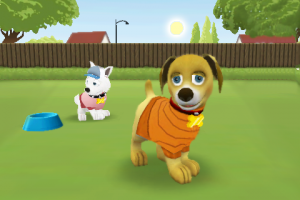 As we reported last month, Ngmoco has announced virtual pet game Touch Pets Dogs, developed by Andrew Stern, one of the original creators of Virtual Babyz, Dogz and Catz. In Touch Pets Dogs, players adopt, nurture and play with their virtual puppies through one-on-one touch screen interaction or on play dates with other players’ dogs from around the world. The ambitious Touch Pets social network, embedded within the game, allows owners and dogs alike to build relationships with other players and their Touch Pets. Puppies’ social lives continue to evolve whether their owners are logged into the game or not, and the results are broadcast for the world to see on the Touch Pets social network dog feed. We first heard mention of TouchPets Dogs at the iPhone Intelligence Party at Macworld San Francisco 2009 in early January. The game is due for a Spring 2009 release.